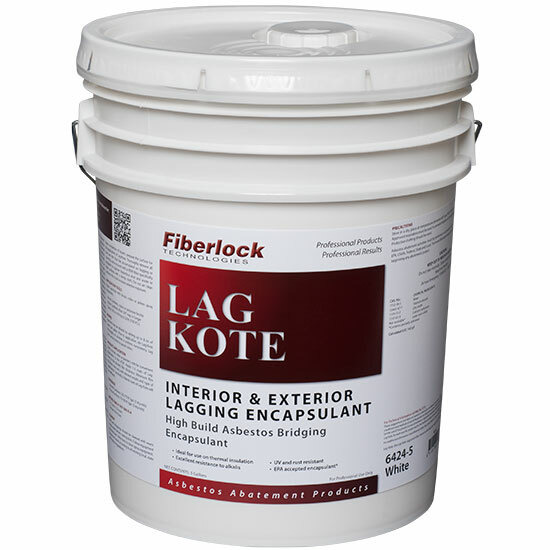 Lag Kote is specifically formulated to be applied over a variety of Asbestos Containing Materials (ACM) and in testing was found to be acceptable as an asbestos encapsulant. Designed to encase spray-on fireproofing, asbestos-containing plasters and paints, transite and asbestos-containing thermal insulation, Lag Kote’s minimizes dripping, cleanup and product waste. The smooth, washable, aesthetically-superior finish has excellent resistance to alkalis and can be applied directly over galvanized metal, wood, masonry or other sound surfaces. Lag Kote was tested for the EPA by Battelle Laboratories and found to meet the requirements for the effective encapsulation and removal of ACM. Lag Kloth Water-Activated Repair Cloth: Lag Kloth should be dipped in water and applied to the asbestos containing material. Upon completion of repairs, prepare the surface for the application of Lag Kote. Thoroughly remove all dust and dirt that has accumulated on lagging or covering, use a vacuum with a HEPA filter specifically designed to capture hazardous dust and waste or wipe surfaces with a damp cloth. Do not air clean surfaces; this could increase asbestos exposure. Apply Lag Kote with brush, roller or airless spray equipment. Lag Kote may be diluted by adding up to 10% water. Prior to application, stir Lag Kote thoroughly to achieve a uniform consistency. Lag Kote can be tinted to pastel colors. Select a brush, roller or painter’s mitt for convenient application to the ACM. Apply 1-2 coats of Lag Kote to the desired film thickness. Minimum film thickness may vary with desired results and type of application.